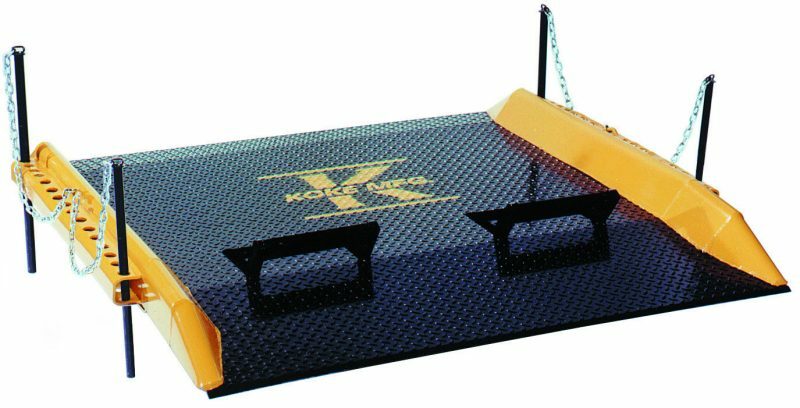 The all welded steel truck dock board is designed to meet the demands of today’s active docks that require high capacity and heavy usage. 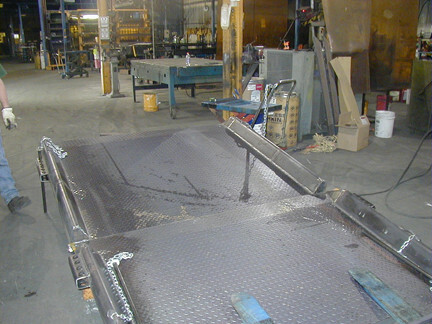 Our steel dockboards start with a sheet of heavy duty diamond plate steel. Formed side curbs are fully welded to protect equipment run-off and for increased strength. The side curbs are also angled and tapered guard against forklift tire damage. Heavy-duty lift loops allow for easy moving of this board, and they recess flush in the board when they are not in use. Beveled edges at both the entry and exit of the board provide a smooth transition on and off. Each steel dockboard comes with two 12” long pin pockets at each end of the board. 1” dia. Stressproof steel locking pins secure dockboard in place. Multiple hole locations allow for flexibility in securing dock board to box, refrigerated and container trailers. The second set of pin pockets are included to allow for limited below dock applications. Please contact us for these applications. Steel Dockboards are available in capacities from 15,000lbs. to 60,000lbs. Special size boards are available upon request. Heavy Duty Dockboard with lifting loops, locking pins and pin pockets. Available in widths up to 78″ and capacities to 60,000 lbs.